We just love the Cat in the Hat by Dr. Seuss! Here we have our adaptation of that wonderful children's story. 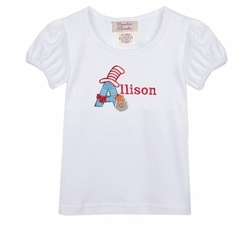 We take a soft, white shirt and applique your little one's first name initial in turquoise gingham with a red and white tall hat. The letter also has a sweet red bowtie and "Fish" in his fishbowl peeking out to see what is going on! The rest of your little girl's name is added after the initial in red. 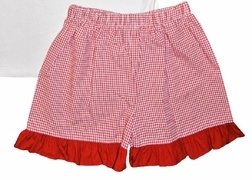 The shirt is paired with red gingham shorts that have red ruffles.